Prick the eggplant all over with a fork and place on a baking tray. Roast for 30 minutes or until tender and starting to collapse. Cool slightly. Meanwhile, place the oil in a deep frying pan (with a lid) over medium heat. Add the onion and cook, stirring, for 2-3 minutes until softened. Add the curry powder and cook, stirring, for 1 minute. Stir in the tomato, chickpeas and 200ml water, then reduce the heat to low, cover and simmer for 10 minutes or until fragrant. 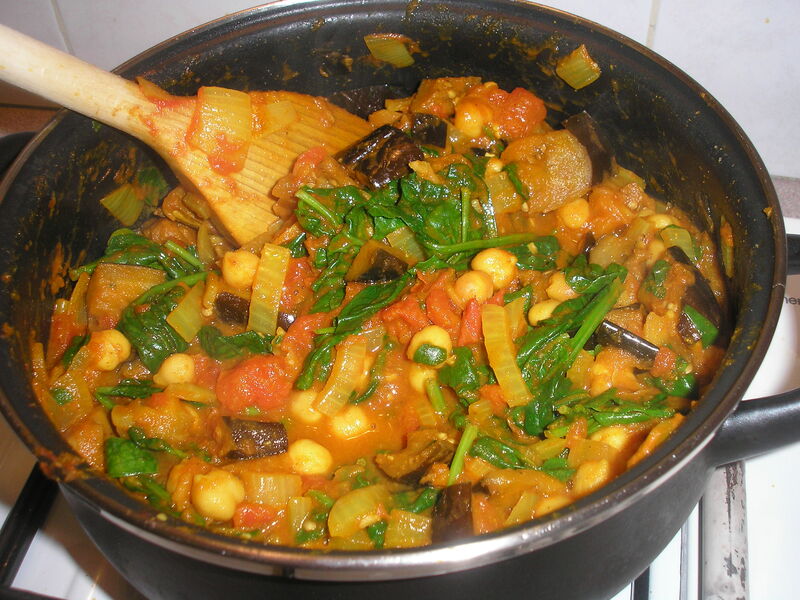 Chop the eggplant and stir into the curry with the spinach and mango chutney. Cook, uncovered, for 2-3 minutes until the spinach has wilted. Season, then serve with basmati rice, pappadums and extra mango chutney. This a very simple recipe to make. I cooked the curry in a small casserole dish. I didn’t have mango chutney, so I added a bit of eggplant chutney. Wash the spinach. And make sure you roast the eggplant long enough so it is soft, it gives a nice smoky flavour to the dish. As most of you know, I didn’t go to Singapore a couple of weeks ago, I was still recovering from my virus/throat infection/cough/loss of voice. So, I decided to get a taste of Singapore at home instead and cook Singapore Noodles ( a recipe from Delicious cookbook: Home cooking). Needless to say, I’m not a great stir-fry cook, actually absolutely hopeless! The photo speaks for itself: on the left, my noodles, on the right the gorgeous photo of what should have been…And to add insult to injury, I did offer some to my Sinaporean-Indian neighbour, who on seeing the stuff in the wok said “It looks like a stew” or some words to that effect! And she told me you don’t soak fresh noodles, you may want to rinse them but nothing more. A comment repeated and emphasised by other noodles experts. In cooking experiments gone wrong, this will rank along my attempt to make brioche many years ago in Adelaide. My friends told me that the brioches would make nice “rocks” for my garden. This a recipe I will never try again. Ever. On the pavement in Hobart, Tasmania. January 2014. Spend time with people who are calm and smiling no matter what happens. Their stupidity will send your blood pressure through the ceiling. Stay alert about your body image and encourage weight loss by wearing underpants that are two sizes too small, and back to front. Many naturopaths suggest Bach Flower Rescue Remedy for stressful moments, but it’s probably easier to get a bottle of Tequila at short notice. 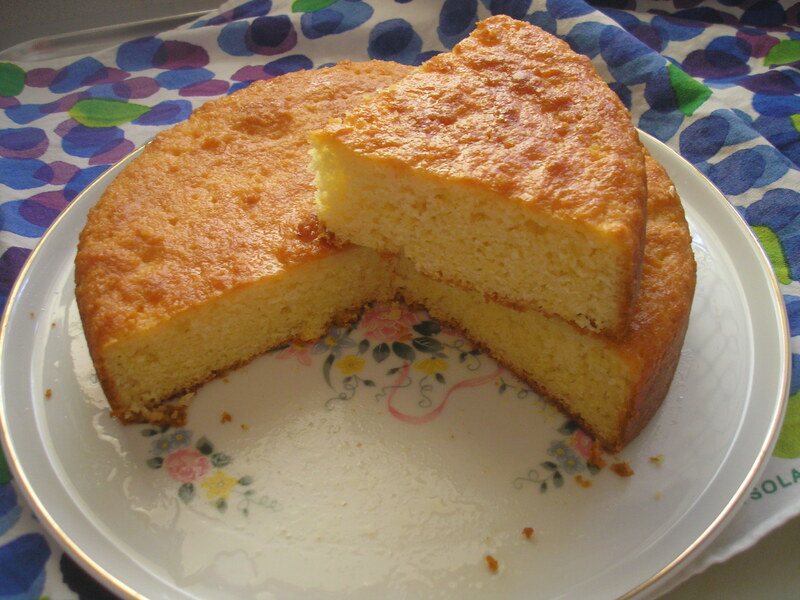 This is a very easy recipe to make, it’s a healthier version of a traditional cake (using yogurt and canola oil instead of butter, and reducing the amount of sugar). It’s a recipe from the Good Food BBC magazine. Preheat oven to 180C or 160C fan. Lightly oil a deep 20cm round cake pan and line base with baking paper. Place flour, almond meal, polenta and baking powder in a large bowl. Stir in lemon zest and sugar, then make a well in the centre. Beat eggs in a bowl, then stir in yogurt. Add egg mixture to flour mixture, along with oil. Using a large metal spoon, gently fold mixture together until just combined. Do not overmix. Fill prepared pan with batter, smoothing top with a spatula. Bake for 40 minutes, until a skewer inserted into centre comes out with only a few crumbs. Cover loosely with foil for last 5-10 minutes of cooking if over-browning. Leave in pan for 5 minutes before transferring to a wire rack. Meanwhile, to make lemon syrup, place caster sugar, lemon juice and water in a small saucepan. Heat on medium, stirring occasionally, until sugar dissolves. Increase heat to high and boil for 4 minutes, until slightly reduced and syrupy. Using a skewer, pierce small holes all over top of warm cake. Gradually spoon over half of lemon syrup and let it soak in. Brush side of cake with a little syrup, then spoon remaining syrup over top. Serve warm or at room temperature. I used grapeseed oil because I didn’t have canola oil. This cake is best eaten on the same day. It’s not very sweet at all and slightly crumbly in texture. I’m older than the internet. I’ve lost an electron. Are you positive? Let’s play carpenter. First we get hammered, then I nail ya. I love dogs, it’s people who annoy me. And I haven’t been slack with my cooking last week, it’s just that I didn’t have time to post my Saturday Cooking entry. Will do so later this week along with a couple of stew recipes. As a friend said, there is a “promise” of cooler weather on the way, we can feel it in the morning, 14C at night and the doona was back on! So time for slow cooking, yeah! Another few gems from Kaz Cooke’s “The little book of household madness”. Embroider the days of the week onto all your underpants. Each morning, you will know which pair to wear. Save old shower caps. Take a correspondence course in practical neurosurgery: you already have half the uniform. All-over body moisturising can be so time consuming. Why not squirt a litre or two of moisturiser onto a ground-sheet and roll around on it each morning? Here is also the recipe for the POTATO AND LEEK SOUP. Heat 2 tblspn olive oil in a saucepan over medium-low heat. Add 2 leeks (washed, trimmed, thinly sliced-I’m using the green leaves from the previous recipe) and cook, stirring for 4 minutes or until soft. Add 3 garlic cloves (crushed) and 2 tblspn fresh rosemary (finely chopped). Cook, stirring for 1 minute or until fragrant. Add 1kg potatoes (peeled and chopped) and 5 cups (1.25l)chicken stock (I’m using the stock from my chicken noodle soup). Increase heat to medium-high. Cover. Bring to the boil. Reduce heat to medium-low. Simmer for 20 minutes or until potatoes are tender. Process soup in batches until smooth or slightly less if you like chunky soup. It may seem a long recipe to read, but it’s very simple to make and delicious! Preheat the oven to 200C. Untruss the chicken, sit it in a roasting tin and put the lemon halves and 2 of the rosemary sprigs into the chicken’s cavity. Cut each leek into 3 logs, then slice lengthways and add to the tin. Remove the core and seeds of the peppers and slice them into strips, following their natural curves and ridges, and add these to the tin. Tumble in the olives, and now pour the olive oil, mostly over the vegetables but a little over the chicken, too. Add the remaining rosemary sprigs to the vegetables, along with some salt and pepper, to taste, and, using a couple of spoons or spatulas, gently toss the vegetables about to help coat them with the oil and make sure everything is well mixed up. Sprinkle some sea salt flakes over the chicken and put it in the oven for about 1hour- 1hour15 minutes, by which time the chicken should be cooked through, and its juices running clear when you cut into the flesh with a small sharp knife at the thickest part of the thigh joint. The vegetables should be tender by now, too, and some of the leeks will be a scorched light-brown in parts. Remove the chicken to a carving board and, while it rests (for about 10 minutes), pop the pan of veg back in the oven, switching the oven off as you do so. Cut the chicken up chunkily, transferring the pieces to a large warmed platter. Now take the pan back out of the oven and, with a slotted spoon or spatula, remove the vegetables to the large platter and when all is arranged to your aesthetic delight, pour over all the juices that have collected in the pan. This will serve 4-6 people. You can get a bigger chicken but you will need a big pan to fit everything in. 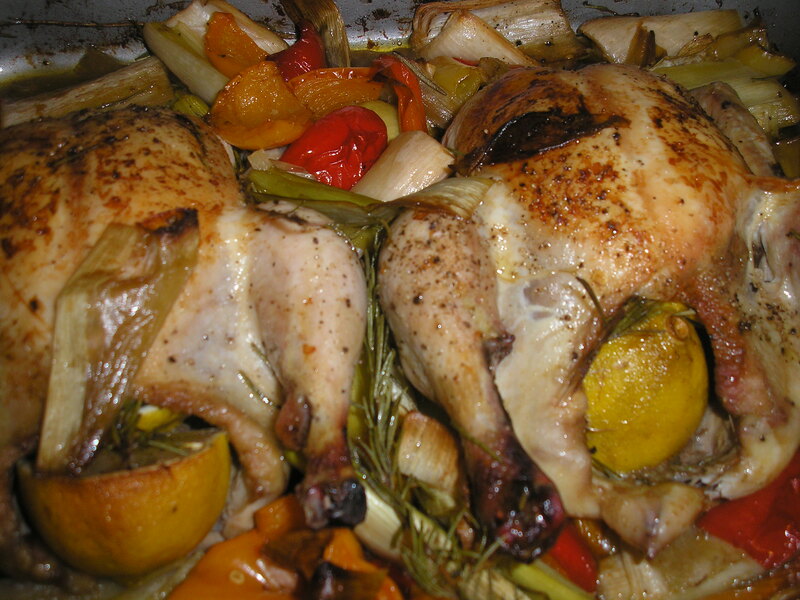 I roasted 2 small chicken and it took longer to cook than the time indicated in the recipe, especially to get the vegetables soft. I also mixed the veges first in the pan with some olive oil before putting the chicken in, less messy. I also added garlic in the chickens’ cavity. The roasted leeks are delicious, so much so that I bought some more at the market this morning and I will roast another load of capsicums and leeks with some garlic and red onions. When I cut the leeks, I only used the white part. I have kept the green bits and I will make a potato and leek soup, even though it’s very hot in Perth at the moment!